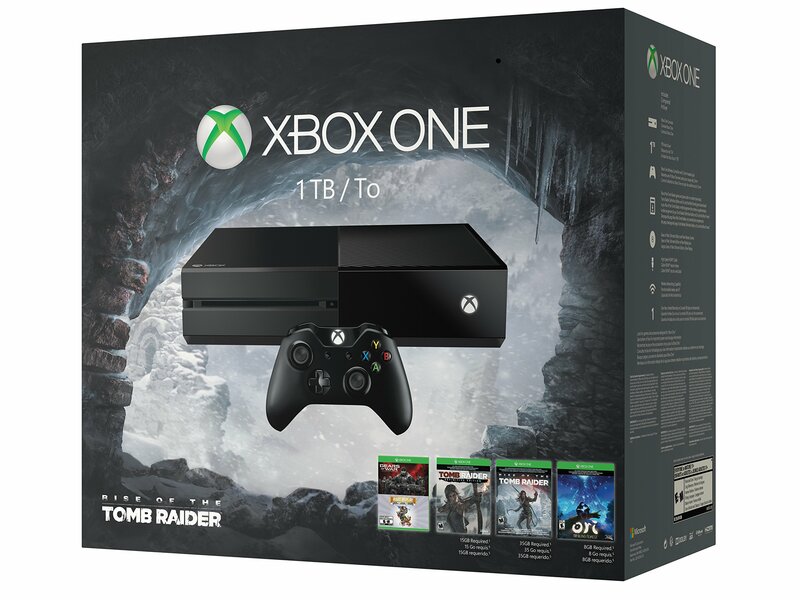 Own the Xbox One 1TB Boxing Week Bundle, featuring Gears of War: Ultimate Edition, Rare Replay, and full-game downloads of Rise of the Tomb Raider, Tomb Raider: Definitive Edition, and Ori and the Blind Forest. Play and store more games than ever, including your Xbox 360 games, with the 1TB hard drive. Experience the original Gears of War rebuilt from the ground up in 1080p, including 60FPS competitive multiplayer with 19 maps and six game modes, and five campaign chapters never released on console. Plus, for a limited time, when you play Gears of War: Ultimate Edition on Xbox Live, you'll get the entire Xbox 360 Gears of War collection to play on Xbox One at no additional cost. Play a jaw-dropping collection of 30 iconic games with Rare Replay, from Battletoads and Banjo-Kazooie to Perfect Dark and more. And immerse yourself in the critically acclaimed action-platformer, Ori and the Blind Forest. Join Lara Croft on her first tomb raiding expedition and witness the rise of an icon in Rise of the Tomb Raider, with epic, high-octane action set in the most beautifully hostile environments on earth. . With new features added all the time, and over two hundred since launch, there's never been a better time to jump ahead with Xbox One. 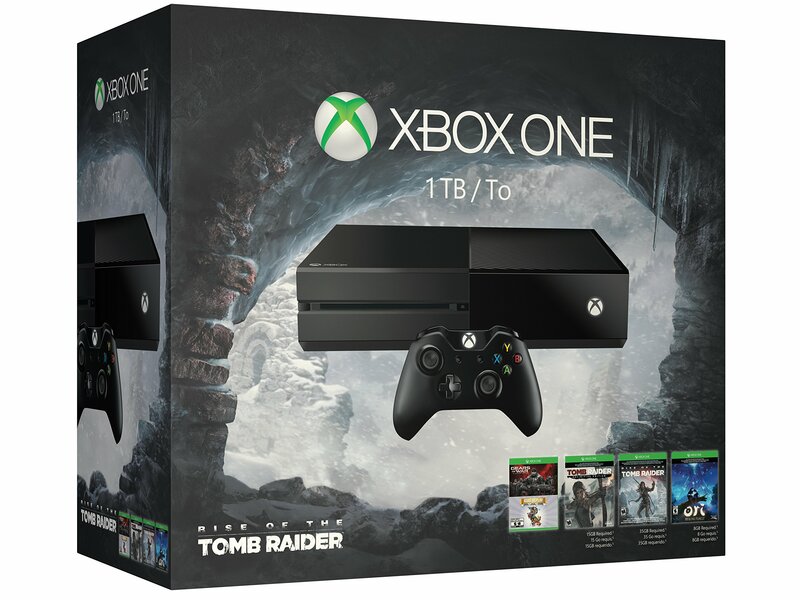 Own the Xbox One 1TB Boxing Week Bundle, featuring Gears of War: Ultimate Edition, Rare Replay, and full-game downloads of Rise of the Tomb Raider, Tomb Raider: Definitive Edition, and Ori and the Blind Forest. Experience the original Gears of War rebuilt from the ground up in 1080p, including 60FPS competitive multiplayer with 19 maps and six game modes, and five campaign chapters never released on console. Plus, for a limited time, when you play Gears of War: Ultimate Edition on Xbox Live, you'll get the entire Xbox 360 Gears of War collection to play on Xbox One at no additional cost. Play a jaw-dropping collection of 30 iconic games with Rare Replay, from Battletoads and Banjo-Kazooie to Perfect Dark and more. And immerse yourself in the critically acclaimed action-platformer, Ori and the Blind Forest. Join Lara Croft on her first tomb raiding expedition and witness the rise of an icon in Rise of the Tomb Raider, with epic, high-octane action set in the most beautifully hostile environments on earth.